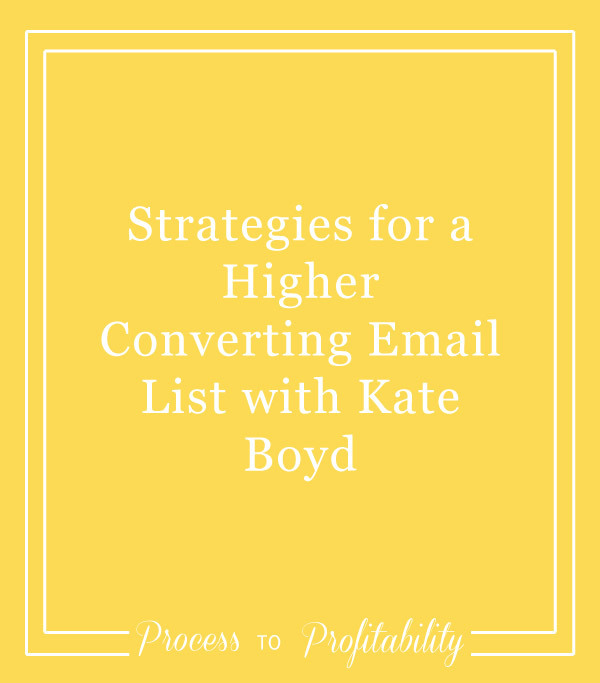 Today I’m talking with Kate Body about strategies for a higher converting email list. She talks about why an email list is so important for your business. Then we talk about what conversions are and why they matter. She also goes into what conversion rates can tell us about our business and how we get started on the right foot or increase conversions in our current email list, depending on your business. We talk about ways you can engage with your email list while it’s still small so that you can figure out who you’re serving and what they need from you so that you know you’re attracting the right people and that you’re giving them what they need so that your business can grow. She also has a really awesome idea for a way that you can increase conversions on your email list that I loved because it’s such a different idea that I have not seen out there. Kate Boyd is the founder of Cobblestone Creative Co., a digital marketing agency that creates hand-crafted strategies and content to convert more leads into paying customers and clients. In 3 years, she has built 3 profitable online businesses and created marketing and sales experiences — both live and automated — that convert 3-5x the normal rates. Kate combines a journalism degree, 3 years of online business experience, and 5+ years in non-profit marketing to support others as they grow, nurture, and mobilize their tribes so they can have success and time to enjoy it too.